This volume evolved from a conference on "Financial Markets Economet- rics" held at the ZEW (Zentrum fiir Europaische Wirtschaftsforschung) in Mannheim, Germany in February, 1992. However, not all papers included in this volume were presented at the conference. In some cases the papers are follow-up papers to the ones presented. The purpose of the conference was to bring together researchers from several European countries to discuss their applications of recent economet- ric methods to the analysis of financial markets. From a methodological point of view the main emphasis of the conference papers was on cointe- gration analysis and ARCH modelling. In . cointegration analysis the links between long-run components of time series are studied and the methods can .be applied to the determination of equilibrium relationships between the vari- ables, whereas ARCH models (ARCH is the acronym of autoregressive condi- tional heteroskedasticity) are concerned with the measurement and analysis of changing variances in time series. These two models have been the most significant innovations' for the empirical analysis of financial time series in recent years. Six papers of this volume apply cointegration analysis (the papers by MacDonald/Marsh, Hansen, Ronning, Garbers, Kirchgassner/Wolters, and Kunst/Polasek) and seven papers deal with ARCH models (Kramer/Runde, Drost, Kunst/Polasek, Kugler, Eggington/Hall, Koedijk/Stork/deVries, and Demos/Sentana/Shah). 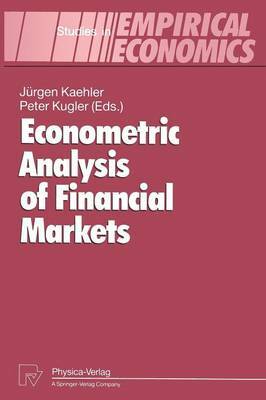 Other econometric methods and models applied in the papers include factor analysis (Eggington/Hall and Demos/Sentana/- Shah), vector autoregressions (Kirchgassner/Wolters and Kunst/Polasek), Markov-switching models (Garbers and Kaehler /Marnet), spectral analysis (Kirchgassner/Wolters), stable Paretian distributions (Kramer/Runde and Drost) and ARFIMA models (Drost).